There's no magic formula for keeping your laying hens healthy. It's a matter of good animal husbandry. Your hens need a healthy diet; a clean, well-ventilated environment; and protection from predators and parasites. 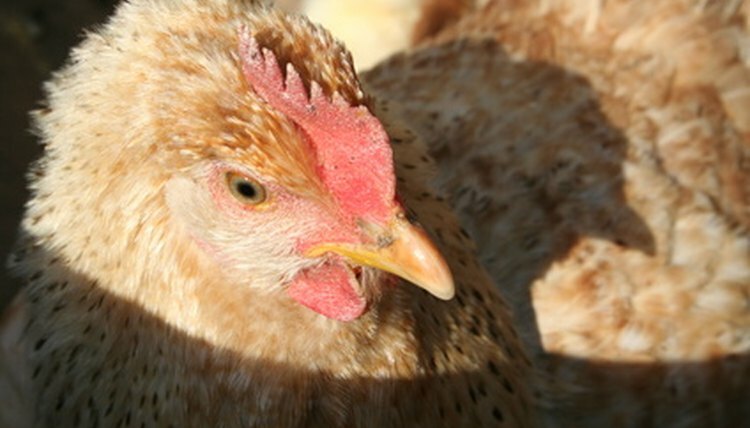 Prompt veterinary care can help you nurse laying hens back to health. If you're just starting your flock, purchase your chicks or pullets from a reputable commercial hatchery. Your birds should have basic vaccinations before they arrive on your property. If you purchase or acquire additional birds elsewhere, keep them separate from your flock for at least a month to make sure they aren't bringing in disease. For biosecurity purposes, don't trade chicken equipment with friends unless you thoroughly disinfect it before using it in your own coop. Before putting your hens in your coop, secure it against predators as much as possible. Check the coop daily to see if any animal, such as a fox or raccoon, has been trying to gain entry. Evidence includes torn chicken wire or holes or weak points on the structure. Cleanliness and keeping your hens healthy go hand in hand. Keep your hens' waterers scrupulously clean, along with any feeding bowls or pans. Depending on the number of hens and the size of the coop, change the bedding frequently. Change the hay or shavings in the nest boxes a few times a week. Ammonia build-up from urine damages your birds' lungs. Thoroughly clean the coop at least twice a year. Remove all bedding, nest boxes, waterers and feeders. Clean the coop and all equipment with a water/bleach mix, allowing everything to dry before you put in fresh bedding and refill nest boxes, feeders and waterers. Be careful that you aren't inadvertently bringing any diseases in. Wear special shoes or boots that are used only for your chicken activities. Along with a constant supply of fresh, clean water, feed your chickens a high-quality commercial chicken feed designed especially for laying hens. Feed should be available to them at all times -- or at least during the day. They also love greens, such as lettuce or spinach, but feed it as a treat. Don't feed your chickens rotten or moldy leftovers. Your chickens should have access to grit, available in farm supply stores, to aid digestion. Inspect your birds carefully at each feeding for any signs of illness. If you suspect that a hen isn't feeling well, immediately separate her from the flock. It's better to be safe than sorry. You can keep her in a cage temporarily with water, food and nesting material available. Take her to the vet as soon as possible. Signs of illness include abnormal droppings, depression, sudden drop in the flock's pecking order, lack of appetite, lethargy, breathing difficulties and the appearance of mites on the bird. In winter, make sure your hens always have water available and check their combs for signs of frostbite.